Made with Grade AA acrylic rhinestones. Various colors available. 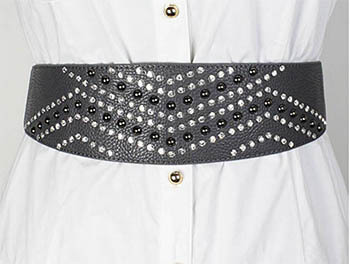 Suitable for belts or motorcycle gear. Rims have a rivet back. Tube length is 4mm (5/32"). Suitable for materials 1/8" thick or 8 oz leather. Non rusting. Ideal for materials of 1/8" thick which equates to 8 oz (belt type) leather. Note that leather thickness is usually measured in ounces. One ounce equals 1/64" of thickness. 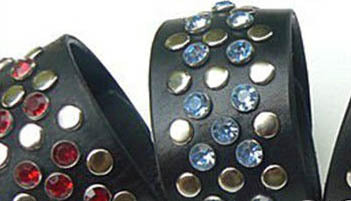 Rhinestone rivets are used for decorating leather belts; buckles; handbags; motorcycle gear or pet collars. They are also very popular in Western fashion. Non rusting means they can be placed on articles that will be washed or will get wet.. Description: This is an acrylic rhinestone preassembled in a tubular rivet. They are ready to set. 5mm is about 3/16 inch and includes the rim. Made of Copper Alloy.